Surely if he had been given the opportunity, Sisyphus would have engineered a way out of his eternal punishment of rolling a boulder up a hill. It’s just too bad for him that Raspberry Pi wasn’t around to help. 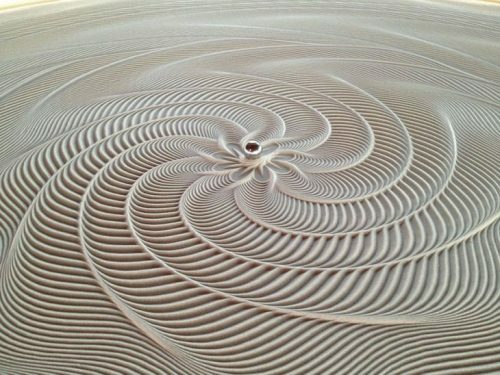 While it’s a far cry from his arduous task, the Pi has been used to power Bruce Shapiro’s Sisyphus, a continuous and ever-changing kinetic art piece that creates unique design patterns in sand using a small metal ball. Sisyphus is truly mesmerising. We learned this first-hand: at Maker Faire New York earlier this month, it captured the attention of not only the Raspberry Pi crew, but also thousands of attendees throughout the weekend. Sisyphus momentarily drowned out the noise and action of the Faire. You can think of Sisyphus as a cross between an Etch A Sketch and Spirograph, except this is no toy. Under the table is a two-motor robot (the “Sisbot”) that moves a magnet which draws a steel ball through the sand. The motors are controlled by a small Raspberry Pi computer which plays a set of path files, much like a music player plays an MP3 file. Bruce is using Kickstarter in the hope of transitioning Sisyphus from what’s currently a large art installation exhibited around the world into a beautiful piece to be enjoyed in the home, as both furniture and art. 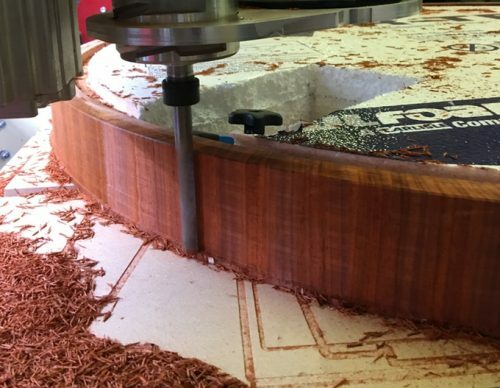 Of all works I made, Sisyphus stood out – it was my first CNC machine to break out of the studio/shop. No longer tasked with cutting materials to be used in making sculptures, it was the sculpture itself. It was also unique in another way – I wanted to live with it in my home. I’ve spent the last three years perfecting a home version that’s beautiful, user-friendly, near-silent, and that will run for years. Like most great Maker Faire projects, it’s centred around a wonderful community. The collaboration and access to tools in Shapiro’s local makerspace helped develop the final design seen today. While Shapiro’s original makerspace has since closed its doors, Shapiro and his fellow members opened up what is now Nordeast Makers. It’s where the production for Sisyphus will take place. 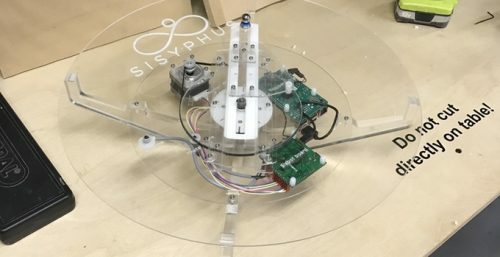 This Kickstarter won’t be running forever, so be sure to pledge if you love the sound of the Sisyphus. Now THAT is beautiful. Very, very nice work. It looks so amazing online, I can only imagine in real life it’s all the more mesmerizing. It’s a kind of magic! With so many backers, looks like Bruce is going to be busy for a while! Oh my!! Whenever you think that the Pi can’t produce any more surprises it does! I am almost afraid to find out what someone will come up with next. Pi + imagination = excitement! I’m sorry but this isn’t original. 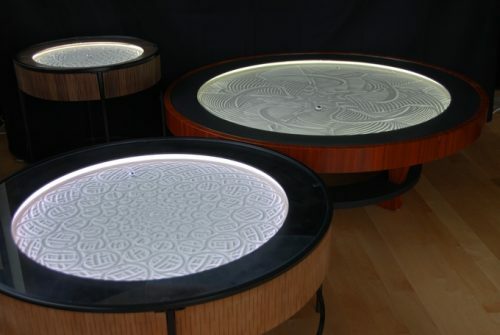 I’ve seen this over a decade ago at the Kavli Institute for Theoretical Physics (KITP) “Jean-Pierre Hébert, Ulysses, Sand installation, (David Bothman & Victor Dinovi, collaborators)”. The similarity between these pieces makes me want to raise the plagiarism warning flag. Who has the patent for oil-paint on canvas? …so I suspect he was first with the idea. I’m still surprised to see so few eggbots in the UK- Two steppers, a few bits and pieces, an EiBptBoard, and a Pi running InkScape…. Sorry, my quote was escaped )?) by the less-than/greater than symbols. I’ve been working on Sisyphus for quite a while now (17 years, though not continuously). I would certainly expect you’ve seen similar things a decade ago. Indeed, the idea is not new. I know Bruce (met him through the Twin Cities Robotics Group), and I’ve always enjoyed his Sisyphus II installation at the Science Museum of Minnesota. It’s been there since 1999. Bruce did his first in 1998, as an X-Y platform. The one at the Science Museum of Minnesota was his first to use a polar based system as opposed to the earlier model’s cartesian system. it’s 5 feet in diameter. It really is a joy to watch! I wonder if the one at Questecon in Canberra Australia is also controlled by Raspberry Pi. Awesome. I think that raspberry pi should show us how to make a mini one.